For several months now, there have been rumblings under my feet. I felt it in the months leading up to my surgery in June and have continued to sense this in the days following. It’s a shift in focus, even if it is somewhat dimmed at times, a new path or direction, a revisiting of paths I haven’t been on in a while, a joining of creative loves to make for an artful life’s work. The above depiction gives you an idea of what I see when I close my eyes and envision the years ahead. 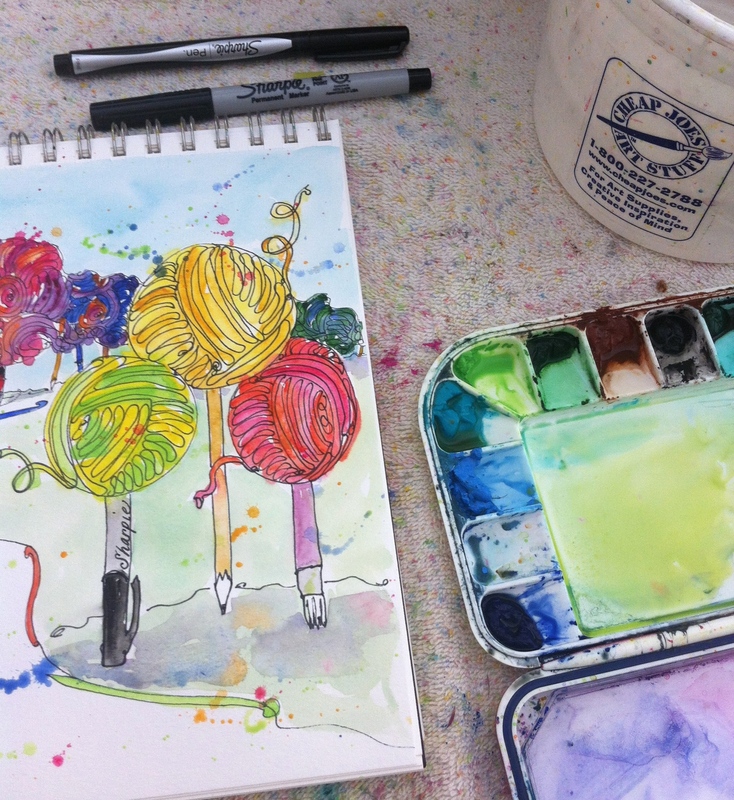 Tree canopies are made of yarn, supported by trunks of paint brushes and all kinds of drawing & writing tools. This blend of creative loves will include teaching knitting and crochet classes again. I am so excited about connecting with women who are wanting to learn and broaden their ability to knit and crochet. It is so enjoyable to get to know women from all walks of life with a common love we share. I am also continuing to paint commissions, and am currently illustrating a book for someone. I’ll continue drawing in and around my town of Kernersville with my drawing friends. I plan to continue creating/designing patterns for folks to knit and/or crochet various yarn projects. I have a lot of them I have not typed up into patterns yet. This is a very satisfying thing for me: the idea that someone elsewhere in our country or across the waters is sitting in her living room knitting something from one of my patterns is just too cool!! I try to write my patterns as if I were sitting right there with her as she knits or crochets. 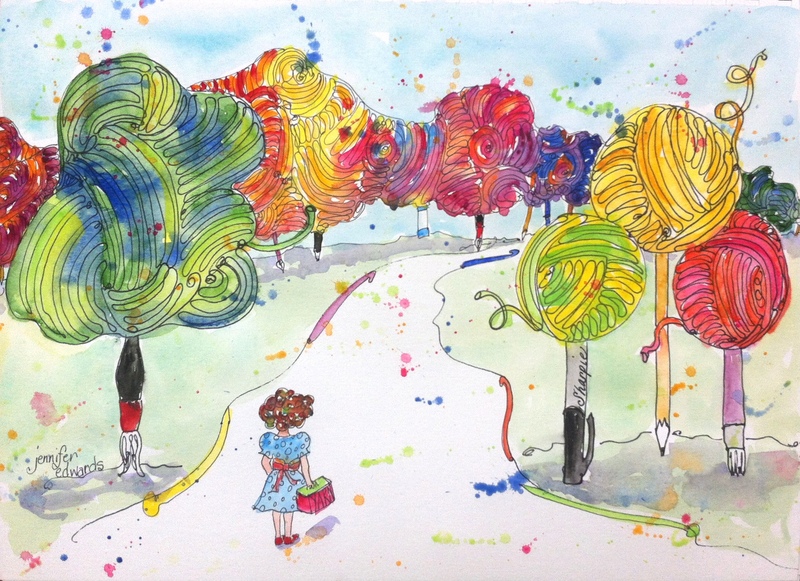 I also want to create a line of cards and prints for yarn enthusiasts. Hopefully this will happen sooner rather than later! And there are many more ideas swimming around in this little head of mine. It does feel like it might explode sometimes, but it’s wonderful to think of the days ahead being filled with one or more of the above. I’m grateful to have the chance to really give it a go. So today. The kids are all in school. I have a painting on my easel ready to complete this week. 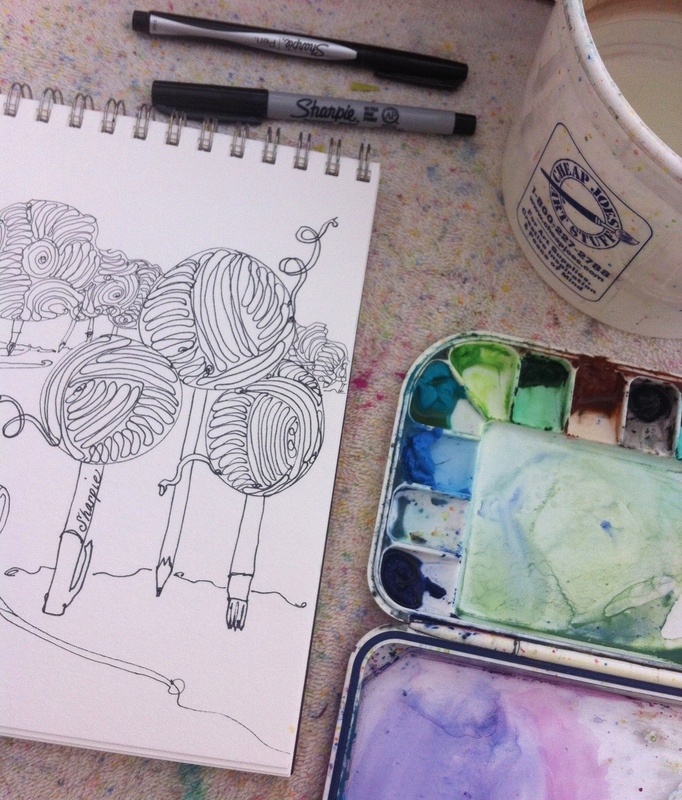 I have a knitting design in the making and black and white line drawings on my drawing table. What I envision may morph and change in the days ahead. That’s ok. With dreams and plans we have to hold them firmly but loosely. Is that possible? Firmly enough to be diligent in pursuing them. Loosely enough to allow them to be redirected. I hope you’ll join me in this new venture! It’s been a great day! I’m happy with this commissioned painting, only a few touches left. Getting ready to work on illustrations. Happy crocheting Sharon! And thanks for visiting my blog!! I am so happy to see your visions coming into reality. Your inner life seems so rich – please share some your spiritual journey. I have a sense that it is the anchor for your creativity. You are so amazingly talented and skilled – please keep posting here. Hmmm, I thought I’d left a comment! Oh well, I will again. I think you have a wonderful and challenging path in front of you. Blending all your skills you can’t help but create something good whether an object or a class! Are you planning to teach your freeform crochet? I think it would be a winner as it’s one people are afraid to tackle on their own! Will be interested to see what you come up with. I would totally love to teach Freeform Crochet! Perhaps an online class would be fun as well! I’m thinking of how to do this too…offer interactive knit and crochet classes online. We shall see…so many ideas Timaree…whew! Thanks for checking in!! Hope you are doing well these days!